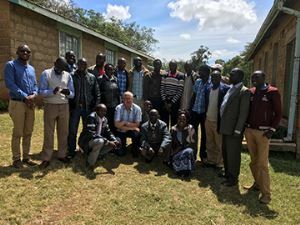 Three colleagues have recently been on the road for an Agriterra project. 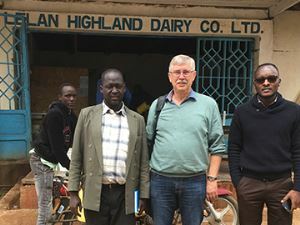 Herman Bunte, dairy specialist at Reudink, was in Kenya for a week to visit two cooperatives, Lelan Highland Dairies and Mrany Farms Cooperative, to give his insight into working with key figures and how this can lead to greater milk production. The basis of the process in Kenya is no different than here in a modern company with 500 cows. “Cows smell the same wherever you go. Also in Kenya, cows need to be well fed, get pregnant in time and stay healthy. And you need to know what the input is and if there’s enough coming back”, says Herman. “During the training I asked the dairy specialists what they now expect from their cooperative. Their answer was: we would really like a motorbike, to make it faster and easier to visit companies. It's presently by public transport, or by walking..... A second big wish was umbrellas. Even though it’s mostly very dry, it can also rain heavily in these areas. And it seems that umbrellas are difficult, if not impossible, to get hold of. I experience this nearly every time during such journeys, how people can be truly satisfied with so little", says Herman with a smile.